In a move that most expected, Louisville quarterback Lamar Jackson has declared for the 2018 NFL Draft. One year after winning the Heisman Trophy, Jackson says he will forego his final season of college eligibility and head to the NFL. Jackson made the announcement Friday morning on his personal Twitter account. 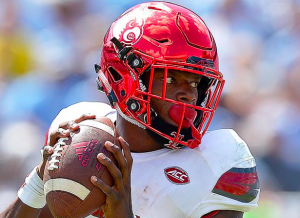 Jackson leaves Louisville as arguably the most prolific quarterback in college football history. He’s the first player to pass for over 3,500 yards and rush for over 1,500 yards in consecutive seasons. He also leaves Louisville as the school’s leader in total yards, rushing yards, rushing touchdowns, and total touchdowns. He won the 2016 Heisman Trophy and was a finalist and runner-up to Oklahoma’s Baker Mayfield this past season. Many have questioned whether Jackson has the right skill set to succeed in the NFL as a quarterback. Some scouts have questioned his accuracy as a passer and foresee a steep learning curve for Jackson in the NFL. Some have even suggested that he’d be better off changing positions, perhaps becoming a wide receiver or safety. However, there’s no doubting the incredible speed and athleticism Jackson brings to the quarterback position. Some believe that considering the instant success Deshaun Watson had during his rookie season, there may be a place in the NFL for Jackson. If nothing else, many feel that Jackson’s athleticism gives him considerable upside if he can find the right system. Jackson will join a deep and intriguing class of quarterbacks in this year’s NFL Draft. The class is highlighted by UCLA’s Josh Rosen, USC’s Sam Darnold, and Wyoming’s Josh Allen, who are all likely to be top-10 picks. Meanwhile, the likes of Jackson and Mayfield are considered wild cards based on how each team evaluates their skill set. With so many teams in need of a quarterback, both could end up being 1st round picks. At the same time, it wouldn’t be surprising to see either drop into the middle or late rounds of the draft. Between now and the draft, there will be a lot of debate about where Jackson fits in the NFL and where he will land in the draft. During that time, there will be bound to be a variety of opinions. However, it’s tough to deny that Jackson is one of the most intriguing players in this year’s draft. It’s even more difficult to deny that Jackson will go down as one of the best college football players of all time.